Renato Tomassi, (National Theater), Rome 1923. Renato Tomassi the Painter (1884 – 1972), Florence 1999.
magico, Rome 2017 and London 2017.
the Painter (1884 – 1972), Florence 1999, plate IX. Berardi Gallery, Rome, 2017, fig. 17, p. 39. My Attendant is one of the foremost works of Renato Tomassi, a gifted artist working in both Italy and Germany in the first half of the 20th century. Tomassi was born in Subiaco, a city outside of Rome, in 1884. Self-taught, he was in contact with prominent members of the colony of German painters in the Italian capital, including the famous painter and graphic artist, Otto Greiner. The early works of Tomassi are characterized by an analytical use of line inspired by the modernist European Secession movement. Primarily portraits on paper, these display great compositional finesse and the influence of German Renaissance portraiture and, in particular, the compositions of Hans Holbein the Younger. The painter’s youthful style underwent a radical transformation in the years following the outbreak of World War I, when Tomassi found himself fighting at the front as a Lieutenant machine gunner in Trento. Like Italico Brass, Anselmo Bucci, Giulio Aristide Sartorio, and Umerto Moggioli, Tomassi was a soldier painter, visually expressing the emotional experience of war. Unlike these other artists, however, Tomassi focused on the depiction of subjects outside the battlefield, mostly scenes of military life, landscape locations, and portraits of compatriots. In this later area, one finds the most radical artistic transition, the abandonment of analytic design favored in Tomassi’s youthful production, and the freer instinctive artistic expression of the painter. My Attendant (The Soldier with the green Eyes), together with Portrait at the Front (fig. 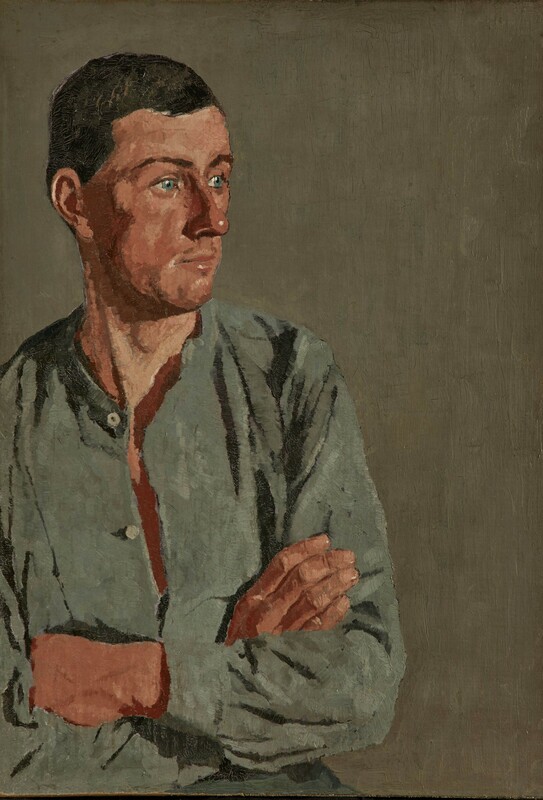 1), and Portrait of a young Officer (fig. 2, now preserved in the National Museum of Fine Arts in La Valletta, Malta), are among the highlights of Tomassi’s entire production.It has been observed that My Attendant reverberates certain portraits by contemporary artists such as Agustus John (1878-1961) and William Orpen (1878-1931) who both studied with Henry Tonks at the Slade School of Art in London. Both of these artitsts served in World War I and painted similar military portraits. These general pictorial affinities reflect the influence on Tomassi of the international modernist movement developing in England and the Continent at this time. pupil of Otto Greiner, he defined himself as a self-taught artist. In truth Tomassi, appreciated in both Italy and in Germany, was an independent artist and never became part of any specific school or avant-garde group, even when he adopted Expressionist techniques. In 1937, Tomassi exhibited his best paintings in the Gurlitt Gallery of Berlin. These paintings (together with the works of other German artists) were later hidden in the vaults of the Nationalbibliotheke in Berlin. Before the end of the war, this library was bombed and plundered and much of Tomassi’s early work was destroyed.